Have you been getting a fat belly? Does this picture look familiar? Well, chances are it does because when a guy puts on fat, the belly is the first place it goes. Most guys have a belly, but are in otherwise good shape. Learning to burn belly fat is a hard, hard thing to do. It takes a combination of diet and exercise. The frustrating thing about belly fat is that once it is there, it is very hardy and simple to "maintain". Meaning, your belly fat is not like muscle. Muscle takes a lot of work to maintain, but once you have fat, it will stay forever without you having to do anything. The only way to get it off is to burn it off. The best way to lose belly fat fast is a combination of a good get ripped workout and the get ripped diet. 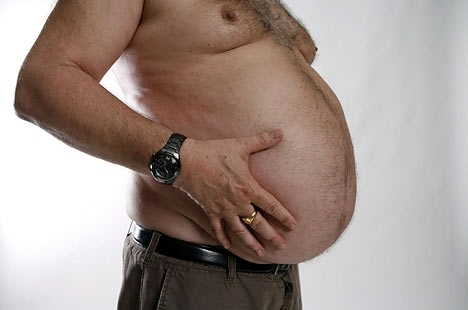 If you've been getting a fat belly or already have one, check out the following tips. Get on the meat/fruit/veggies diet. It's simple and VERY, VERY effective. This is the foundation of a good get ripped diet. You cook a bunch of chicken breasts, cut them up, and then do the same with raw veggies and fruit, put enough for a day in a tupperware container, and take it with you. If you do this 6 days out of the week and give yourself 1 free day where you eat anything, the fat will start melting off of you faster than you can believe. But for the 6 days, NO CHEATING... not even a little or it won't work. Add more protein to your diet. Protein will help you burn belly fat by boosting your metabolism. The easiest way to do this is to get protein powder and make 2 water bottles full of it each morning and take it along with your meat and fruit. Drink a ton of water. Drink enough to where you have to pee 4-5 times a day. When you work out, make it count. It HAS to be high intensity. High intensity workouts are the best way to lose belly fat fast. Jogging or walking on a treadmill will only make you think that exercise doesn't work because you'll never see results. Try this at home: Time yourself when you do this.... I want you to get down and do pushups until you've done 30, as soon as you're done, flip onto your back and do 30 crunches, as soon as you're done get up and do 20 jumps: just squat down then explode up and jump in place as high as you can, when you've done 20, then do 30 body squats.... You've just done your first circuit workout. Now, do the circuit again 2 more times. Circuit workouts, or interval training, is one of the most effective weight loss programs to prevent getting a fat belly. You simply stack 2 or 3 or 4 exercises in non-stop format, take a 1 minute break, and then do the circuit again 3 or 4 times. It is cardio mixed with strength training and it puts your metabolism into overdrive for 24-48 hours.